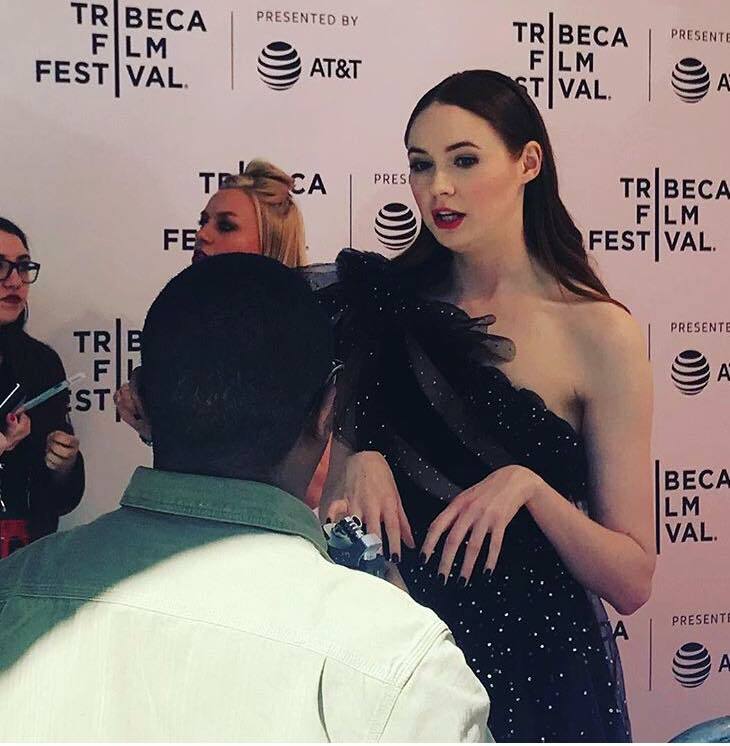 Earlier this year during the Tribeca Film Festival, I had the absolute pleasure of speaking with actress Rachel Jackson, producer R. Andru Davies, and director/producer/screenwriter/actress Karen Gillan on her directorial debut “The Party's Just Beginning” at the film’s world premiere red carpet. How does it feel to be directing and writing and starring in your first feature film that you did all on your own? Karen Gillan: That is a really surreal thing to hear. I think I am having a complete out of body experience right now about this whole thing. I mean, it wouldn't be fair for me to stand here and say that I did it all on my own though. You know, I had an amazing team of people working with me and yes I did a lot of multitasking while making this project. But yeah, I had such incredible people working with me as well. So, since this is your love letter to Scotland, in the same vein that “Lady Bird” was this love letter to Sacramento. How, does it feel to be showing this part of Scotland to the rest of the world? Karen Gillan: I was really keen to show, you know, where I'm from to the rest of the world because I think the only other time we've ever seen it is in this film called "Loch Ness" starring Ted Danson. Karen Gillan: By the way, I loved that film but it’s very different from mine. You know, my film, I wanted to kind of take a postcard image of the place and incorporate that because it is incredibly beautiful and picturesque but also show the other side of it, what it's really like for some people that live there and, you know, it's a very dark subject matter that the film tackles, but I think that my sense of pride right towards the place still shines through the darkest parts of the film. How was it like directing a feature as opposed to a short film and what was the writing process like? Well, the writing process was extremely challenging because I'd never written a screenplay before. I wrote it for six years ago when I was working on… I think it was “Guardians of the Galaxy” or something before that. It was a long process for me and a learning process. I feel like I learned a lot about writing since having gone through the whole process of making a film. But it was... it was great. It was such a rewarding experience. I can't wait to do it again. Can you talk about your character in the film? Rachel Jackson: I play Donna who is Lucy's other best friend. The one who didn't kill themselves. Liusaidh is really struggling to connect with anyone which... I bet she's already told you this. And my character is the den mum to do her. I say “mom” just really bad, by the way. We say mum. And I'm like... my character is struggling just, like, just in general, but she's trying to keep a lid on it. So what made you want to take, uh, take this role? Rachel Jackson: Well, I was offered the role and I love dark comedy and this is definitely a very dark comedy so that’s kind of why I was interested to do it. And to work with Karen because she's an actress and a director and it’s her first feature, so to be part of that is really exciting. Since this is a movie filmed in Scotland and this is brought to America, uh, how, how do you feel having this story brought to the entire world? Rachel Jackson: Oh my God. It's very exciting. I think... yeah, no doubt that’s just beyond exciting. Scotland. It's a small country, but it's a very powerful country. So it’s great that works like this are getting seen across the pond as well rather than just being stuck in Glasgow forever. So, the fact that we're in New York City, it's so exciting. Is this your first Tribeca? Rachel Jackson: It feels amazing. I'm so glad to be here. Thanks for having me [laughs]. What do you wish your viewers to take away from this movie? Rachel Jackson: Hopefully just open up a discussion about mental health problems because a lot of men do kill themselves, and women, don't get me wrong, but I just mean... I think... I think everyone either suffers from depression or knows somebody who has. I think it's imperative to talk about it before you make that final decision because there's so much help out there. I think people feel lost when they feel that bad. They just think the only way out is to kill themselves when that's really not. So, I'm hoping this film raises awareness, because there's not that many films about suicide, so I think it's a really, really good springboard for discussion. ﻿What made you want to produce this project? R. Andru Davies:	The company I created, Mt. Hollywood is built around the idea of creating a project for women and minorities in positions of power. Uh, so this is a strong female story written, directed, starring a woman. Our goal as a whole is we want to create these projects with the point of view of the filmmakers with as little interference from Hollywood as possible so they get to tell their own story. Um, the overall goal of course is that half of all projects should be created by women. There were 800 movies made in America last year. That means 400 movies this year need to be made by women just to make it equal. So here's our one piece to… to keep that along. And it's, it's an amazing filmmaker. Karen's amazing to work with. She's an incredibly talented star. So the two just made for a perfect combination. Is this the first feature from your production company? R. Andru Davies: It is, it's our very first one. So it's the beginning of a lot of great things coming up. What message do you think the film will try to deliver to its audiences? R. Andru Davies: This... this project. There's a lot of different messages in here, so I would definitely say watch it because the audiences we've had come out with a lot of different thoughts and where it touched them. I mean, the greatest thing is it's a real honest story that you can feel didn't come from a place of over saccharine sweetness. It comes from real, real stories. So it’s great because real people all connect in different ways. How was it being on set producing and being with the rest of the cast? R. Andru Davies: Amazing. They're absolutely amazing. Highly disciplined, amazingly talented. This is going to be the first of our many many projects. We're going to look back and say she was one of our great filmmakers and we're looking forward for more and more. 'The Party's Just Beginning’ is A surreal coming of age story told from the perspective of a young Scottish woman (Karen Gillan) trying to cope with the suicide of her best friend and struggling to confront what's truly haunting her.